As a filmmaker, I always enjoy talking to folks who might be, interested or are very interested, in making films. I like finding new talent. Yesterday I got to do both. I was invited to an acting class by a local lady who finds raw talent and sees what they can do. Not really knowing what to expect, I conscripted my screenwriter and gathered my gear. It was going to be the first time to use my Sony a7III in a real studio environment. And it didn’t let me down. My a77, the camera that I have been using for the past eight years, did. I honestly didn’t have any idea just how behind the times it was. The class went as expected. I gave my story which seems to be getting longer and longer as time passes. I guess I am going to have to decide what high points are the ones that I want to talk about; there are just too many good things. The class was full of novices, amateurs and a few professional amateurs, so they mostly didn’t mind hearing my harrowing tale about how I went from a rusty photographer to an actual award winning filmmaker/screenwriter. Those stories always go over great when the folks in the room have nothing to compare them to, lol. I brought all of my gear this time around. Most of the time I just bring a camera and that’s it, but I am tired of not being able to hear the folks or having poor lighting washing out the contrast. I set up a basic two point lighting system, my boom mic and recorder with the help of my screenwriter. The cool part is that the class was being held at the local photographer community room, so I was able to get a backdrop that wasn’t a bare egg-shell colored wall. Always a plus. I set up both cameras, the a7III and the a77, as an A and B camera. A is always the best camera with the lesser picking up slack where needed. The first thing I noticed was that the a77 had way too much contrast in it. The settings for that camera have the contrast set to -3; it was still way too much. 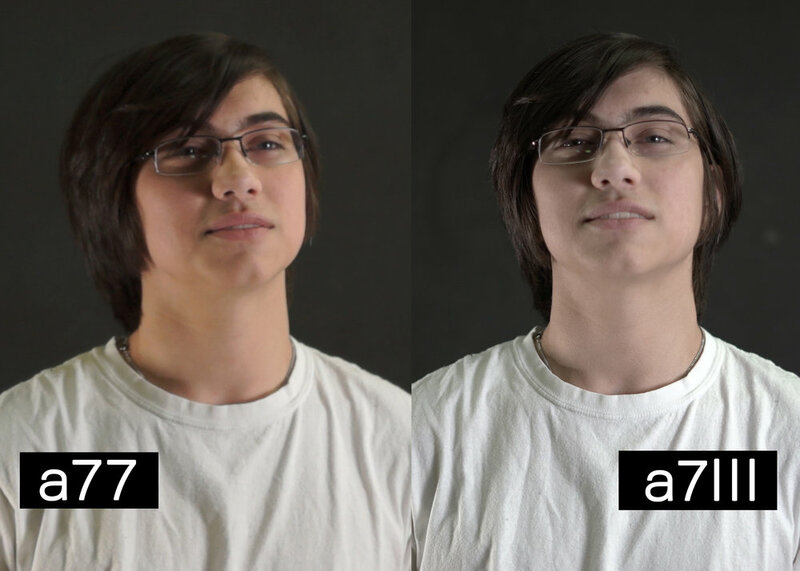 The a7III was set to the same settings but with demonstrably less contrast and way better skin tone over all. This made it very difficult to edit the color in post. I guess I am going to have to boost the contrast on the a7III if I am ever going to get them to match without breaking the footage in post. Then there is the sharpness of the images. Since there was only one camera operator (me) and only one director (also me) not all the a77 shots came out super sharp as I wasn’t overly concerned with it being in focus for every frame like I was with the a7III, my main camera. It is a bit of an unfair comparison between the two cameras. The a77 is the best technology of 2011 competing with the best of 2018: the a7III. You probably already guessed part of it. I had the a7III set to record 4k while the a77 can only do a decent 1080p. Just as a matter of fact, the a7III is going to be a much sharper and more color neutral image. As far as noise is concerned, there is no comparison. The full frame a7III will always out perform the crop sensor of the a77. I was expecting more out of my old war-horse though. I set the ISO to 400, and it was beyond terrible. The a7III had to have it’s ISO on 100 as it is an over-achiever when it comes to light sensitivity. The lenses, well, there is another rub. This is why I am not going to pixel peep in this review. I left on the Sony kit lens of 18-50mm on the a77 that isn’t that great while using a brand new Sony 50mm on the a7III. There just isn’t any way to critique the image with that going on. I chalk most of the sharpness up to prime vs zoom and 4k. Zooming in on the noise lets us know just how much there is. Interestingly, there is quite a bit of speculation that the a7III footage in 4k at 8 bit color is actually akin to 10 bit color in a 16x9 format. You know what, I believe it. You see, it wasn’t the inability to adjust the color on the a7III that got in my way, it was the a77. To make them match at all, I had to color the 4k footage to match the 1080p stuff. Just another lesson learned. Thank God it happened on a day that I was goofing off and not at a paid shoot. Of course, both cameras have built in microphones. The interesting thing there is that the a77 has better audio than the a7III. I have also noticed this on professional shoots using the a7III with a microphone plugged into the audio-in jack. The a77 just does a much better job at handling the input and controlling the auto gain than the a7III. Yes, I know, only crazy people use the audio input jack to capture the main audio. All I can say is that when you’re a one man band, you gotta sacrifice something or it will take all day. Sony did update the color space the camera records, thank God. For those of us with the right eye, ALL Sony cameras had a slight green tint to them that you had to color-correct every time you would go on a shoot. With this camera, I have never had to to that. The color is better in every way in the a7III. Everything being considered, I am glad I have the Sony a7III. I am glad that I have the Sony a77 as well. After all, it’s better to have two cameras rolling instead of one. We respect your privacy. I hate junk e-mail just as much than you do, if not more.